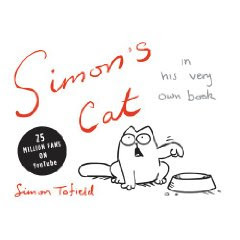 Everyone who is bossed around by a feline will surely recognize many of the situations in the delightful book Simon's Cat by Simon Tofield. The mischievous feline has become an Internet star, thanks to having his adventures documented on his on Youtube channel. The book contains more delightful antics from the feisty feline. Some of my favorite adventures detailed in the book include trying to force kitty into a pet carrier (not a good idea), playing with the box instead of the intricate and expensive toy, plant chewing (and the results) and playing with his friend the garden gnome. Some of the drawings are absolutely hilarious and really ring true. There were a few repetitive drawings in the book, such as the cat's attempts to trick birds into thinking his mouth was a birdhouse and sticking things on a hedgehog (?). Those are minor quibbles, though, in an altogether delightful book with an adorable hero. I'll be anxiously awaiting further adventures from Simon's cat!